I have long believed that America’s strength lies in our nation’s diversity — not its exclusion or isolation. We are a nation of immigrants and benefit from a national fabric woven with the threads of many people, of many backgrounds and cultures, all united in the common belief and love of American liberty. That’s why I championed immigration reform as a congressman. It disturbs me that the Republican Party under President Donald Trump is now defined as a party hostile to immigration. We are the leader of the free world, not because we are great (or need to be great again), but because we are good. 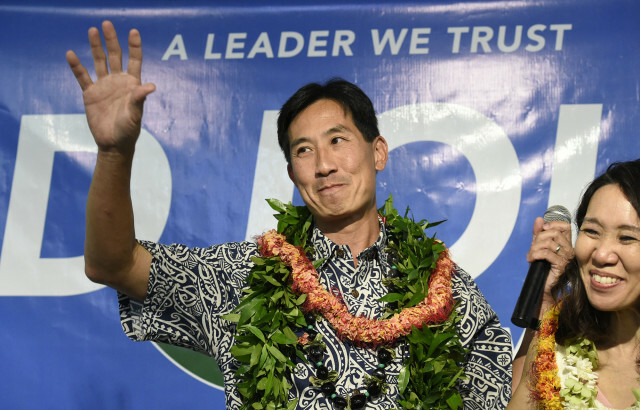 Charles Djou with his wife Stacey addresses his supporters after losing the 2016 Honolulu mayoral election. I have always supported robust international diplomacy and free trade. As a congressman, I advocated for passage of the free-trade agreement with South Korea and strongly supported the Trans-Pacific Partnership initiative to expand free trade across Asia with the U.S. Trump’s decision to withdraw from the TPP, his threats to leave NAFTA, and now his desire to launch a “good trade war” — even with our allies — will lead to long-term economic decline and weaken our country. I believe in peace through strength. That is why in the days after Sept. 11, 2001, I joined the Army Reserve and subsequently deployed with an infantry combat brigade in Afghanistan. That is why I am so disturbed by Trump’s repeated callousness toward the select few of our citizens who volunteered to defend our nation with their lives. From ridiculing John McCain’s service as a POW in Vietnam, to trivializing the grief of gold star mothers who lost their children in service of our country, Trump’s actions are indicative of a man ignorant of honor and true sacrifice. I believe the free market is the engine of America’s economy. Like Trump, I, too, am a graduate of the University of Pennsylvania’s Wharton School of Finance. Unlike Trump, however, I oppose favoring corporations based on their political relationship to the president. That is exactly the sort of socialist-style interventionist meddling that leads to economic ruin. Most of all, I have long believed that our government leaders must lead by example. Character counts. I have long believed that our government leaders must lead by example. Character counts. This is why I made the lack of ethics at City Hall and abuse of power by Honolulu Mayor Kirk Caldwell a key issue in the last mayor’s race. This is why I fought so hard to clean up the corrupt City Liquor Commission. This is also why I roundly condemn the immoral behavior toward women by Democrats like Al Franken and Bill Clinton, as well as Republicans such as Roy Moore and, yes, Donald Trump. It should not matter if you are conservative or liberal, Republican or Democrat, a breach of public trust is a breach of public trust. Civility is an inner trait of true character. Trump’s belittling of Sen. Jeff Flake and immature name-calling of Sen. Bob Corker reflect a weakness of character. Trump’s penchant for conspiracy theories, such as his assertion that Sen. Ted Cruz’s father was involved in the assassination of JFK, is disturbing. His poorly constructed stream-of-consciousness tweets are not only immature, but provide real harm to the stability of our democracy. Sadly today, too many Republicans either applaud Trump’s tirades or greet them with silent acceptance. But I am most disappointed by the failure of the GOP to clearly and consistently condemn Trump’s childish behavior. Sadly today, too many Republicans either applaud Trump’s tirades or greet them with silent acceptance. This leads to an implicit ratification by the GOP of Trump’s undisciplined, uninformed, and unfocused leadership as a core part of the Republican Party. This is something I cannot accept and will not be a part of. Today I humbly follow in Churchill’s footsteps.